A new poster has arrived on the damoncarltonandapolarbear.com web site. The poster depicts the scene from season 6 in which Charlie and Desmond plunge into the sea and Sideways Desmond has a flash of the alternate Charlie. I'm not too crazy about it...but then again it's not bad. I suspect there may be some time for you guys to get to like it before sell out. Not bad...but not exciting enough. Keep telling myself...No wall space! Not my favourite LOST poster ever, but at least I have time to contemplate it. yeah it's hard to get a good look at it up close and personal. I wish they had a larger copy to check out on line. I've put a slightly enlarged version on the main blog post. I really don't want to say it, but I'm going to - that's two prints I don't like, and a mixed bag of T Shirts. Mind you, I didn't some of the first batch, so there's still time. Loving that none are selling out. Means fans have a chance at this batch. 500 prints..lots of this to go around. i like the glow in the dark touch but the image isn't worth it, plus the edition size is huge. Yes, scoutpost, that sounds like a nice feature. Jensen's tweet was "Hey, #LOST fans, its 1:08 PM on the West Coast. DamonCarltonAndAPolarBear.com"
Hint of things to come on the timing of the remainder? Are we talking order #'s again? Hey guys I'm just lurking this time around. I did buy a couple of T shirts though. Ahhh, only just got that it's the NPB from this season. Not very clear what it is though tbh. Definitely a pass for me. It's good we're having a chance to mull it over again. But remember last time around how many of us wished we'd bought the early ones when we had the chance! Martyn... Aren't these ALL supposed to be from S6? Hello Argies..Well..I have it on order..liking it or not isn't the issue..there is a Must that has to be obeyed..Quite simple actually. I am trusting it to what ever future comes of it. Strange..I was visiting the site not 5 minutes before this one went Live..
no need... got it now. This print is more interesting than some from the 1st run. Underwater! bet this won't sell out any time today. the kevin tong prints are still up too. Good point Capcom, the first 'spillover'. Maybe there will be a Dr. Linus one. Exactly, I forgot that and thought it made no sense. I had a stupid moment! The die hards are def picking this up. Been about 30 min and it looks like if this was just 200 rather than 500, it would be close to a sellout now. They listened, increased the run size, hasn't deterred most of us, but has given many more the chance to get it for just $63. If someone could make a poster of Jack trashing the mirrors in the lighthouse screaming "WHAAAAAAT?!" like in the Lost Untangled video, I'd happily go into debt for that one. Agreed TKI, kudos and thanks to them for giving more fans a chance for purchase. this poster should gauge to see what fans really thing of the new stuff. I'd put money on a lighthouse print of some sort. All sorts of possibilities there. A landscaper could do just the building, or we could get some cool mirror smashing. I also expect to see: Jin and Sun's final moments, MIB's cave, Sayid in the water, the Temple (maybe with Smokey trashing it). I must admit tho..as i processed thru the buying..i had tinges of the gut wrench of the 1st run.. My doctor has advised staying away from that phenomena. I appreciate all the passes. Picked up as this may be the only Charlie poster we see from DCAAPB and LOVE the colors. Think it will compliment Kevin Tong's Hatch nicely. For me it was a definite OMG moment when watching the show this season. Hoping we do get a Lighthouse poster. So could it be a new poster a day (starting today)and leaving us next Sunday just to have to worry about watching the show and not F5'ing??? JPL, exactly, no way they will have a final poster on the day of finale. cash415, not so sure about your hypothesis. A Saturday drop at random time doesn't compare to the buildup and notification they did with the 1st series. A familiar artist like Danger or Moss, or a *really* arresting image by someone new, and this will go back to install sellouts (or close). Just wait. I think DD would do a great landscape of the lighthouse. Oooo, I'm just drooling at the prospect of all these posters. Apparently, according to Jensen, this poster is going to be amazing in person. Shame it doesn't grab me enough. Look forward to tomorrows reveal! Although the I predict the Tong is the only one I'll get from this series. It may have the kind of elements The Hatch and Jacob Cabin's had in the backgrounds etc. The kind of detail you have a hard time seeing online. Because it NPB from this season...when Charlie ran Des' car off the dock into the water and Des started remembering the island. Totally not a fan of this. Which is good, seen as I really can't afford it. Pass for me. I'm just sad that these 8 are only going to focus on Season 6, I felt seasons 4 and 5 were greatly under represented in the first poster run! I was dying for something Incident related. So has anyone else had this happen when purchasing. When I added to cart, it said total was $100, but when I went on to checkout... price was $50. Also, if Jensen is going to drop these at times related to show, do you think we'll see an 8:15 or 3:16 drop? Or is 1:08pm going to be the magic time? @Andrew- did they say it would only be S6? I missed that somewhere, but it's probably right. The reason the first run was mostly through S3 was because they started the project long before S5...maybe even during S4...so that's why they didn't have any from those seasons. Andrew - Juliet's death replayed at beginning of S6, so maybe we'll see it included. I like this one. And I appreciate the larger print run. hmmm...do you think it's safe to step away from the computer for a while? darn that Jensen! I got one... took a little bit of time to decide, but I think I like thing one more than most of the last batch. Hhhmm..maybe not a I'm with MIB...but a more surreal.." I'm With Him" poster would be to my liking..especially if it included Kates eyes popping out of her head..
they took away the quantity req box so we can't do the remaining qty trick. i'm waiting to see what the bigger artist have stored for us. hopefully they ask eric tan to do another one and also stout. I want Todd Slater to do a Mr. Linus print, to sit side by side with his earlier one. THAT would be smart. @Ben Todd Slater Mr. Linus would rule the school! @Capcom Bwahaha! Lets all spend money like we got it! howabout Lockezilla removing the dirk from his chest..that was pretty dramatic..
Ben Linus digging his own grave.... Illana going kablooey, Hurley seeing Jacob... so many moments. My money is still on the ones I mentioned earlier, mind you. For me this was a NO that rapidly veered to a YES. Love the colours. From a great S6 ep, maybe my favourite. Des & Charlie. Sideways Land. Cool vibe. good morning, afternoon and evening! This is a who's who of Lostargers posting today. Hello, you all everybody! and hoorah for Charlie Pace and Desmond themed print. I did purchase, but mostly out of reflex. I have had a moment to 'look' closer. Season 6 is all about water as per Damon's subtle hint and this is certainly a water cooler moment. The dreamy blue color plus glow in the dark works well with The Numbers and Crash! The style is unmistakable for Little Friends. We are being reconnected! and that's a good thing. So for 7 more days let's enjoy the ride. tomorrow's drop had better not be 8:15am UK time. Because I've been drinking whiskey for four hours, and I ain't making that. There are so many beautiful moments in "Ab Aeterno" that I would love to see something from it. And while Brandon Otto touched on it in his prints, there's some great beach scenes. Had to make my way back here, despite passing on this first run of posters. Good to see familiar faces, and interested as to where this may go. Any ideas/assumptions as to the new artists that are going to be involved? Hello everyone! Been a long time. I'm glad to see a bigger print run, though I could see this going the way of the last set as soon as flippers realize more are emerging. Glad I got this one though. Great moment from S6. Curious to see what comes next...though my credit card is already starting to moan. I can't decide whether I'm gonna go for the whole set or not! My bank account is going to smack me in the face if I do. Good night all, I know that usually means an update, but I'm fairly sure we are safe until tomorrow. 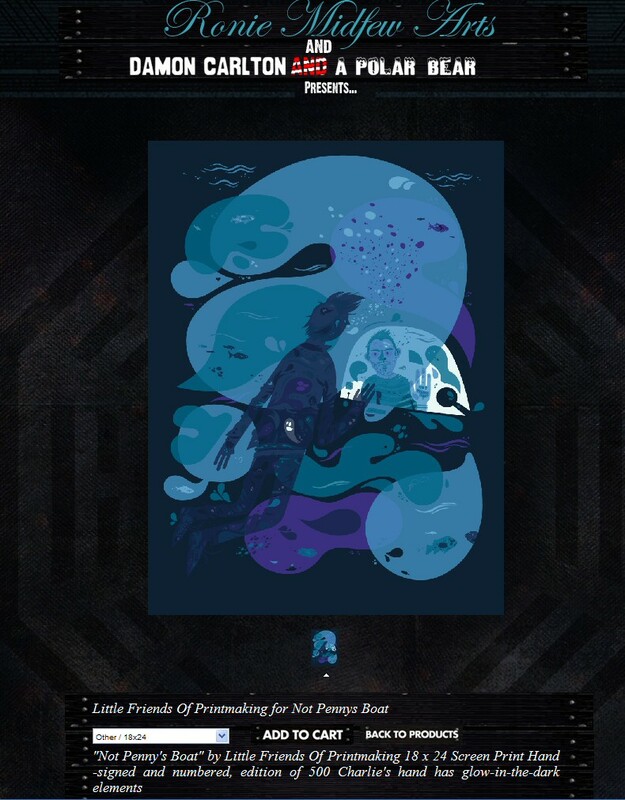 I was away during the "reveal", so.. did this poster just showed up with no advise? I like it, but like i like the dharma van or Ben.. something i can pass. I would INSTANTLY buy ANYTHING about TITUS. A poster a day, revealed at 1:08pm PST is really spectacular. I'm hoping that's the plan. I think it's awesome that they brought in more artists to do a finale-week promotion. This should be fun to watch. I also got some of the shirts. I know some people don't like them, or think their mediocre, but I really like them, especially the Not Penny's Boat shirt. And the bag is hilarious. This one isn't for me. I can't afford all 8 so I'll have to be picky. 1:08pm PST is 5:28am for me so it looks like I'll be up pretty early all week! At least if it stays constant I won't have to be up all night. Crazy to see it all starting again. Seeing a new print up on the site really brings back vivid memories of last fall. It's almost a little surreal. I like this print a lot. It has a beautiful design and colour sense to it.I prefer it over at least 5 prints from the first series. If revealed last December it would have sold out just as fast as any of the others. Congrats to those who picked it up! I have a feeling this is one of those prints that will look fantastic in person. From Damon on twitter; "Okay. This is fanmade and rocking. WOW. http://tinyurl.com/2ecknhg "
He's right, it is really really well put together (and spoiler free). Holy crap. That was the best fan-made trailer EVER! Hey, this might have been pointed out by someone earlier, but on the top of the new DCAAPB site it says Tyson Givens t-shirts, Tyson Givens merchandise, Tyson Givens Hoodies. Does this mean we'll see a hoodie soon? @jason - I think so too. @middayshadow - If it was on the ABC promo contest, it would have definitely won. I don't think it'll be as predictable as 1:08 every day. A) there's lots of timezones, b) lots of numbers associated with Lost, and c) are we even certain it's one a day? Yeh, I also doubt it will be at 1.08 a day however Im willing to bet it's one a day. 7 Days to the finals, 7 posters left. I was actually hoping they'd "push the button" and put up a poster every 108 minutes, but 1:08pm everyday would make sense to me. Doing it at 1:08 in different timezones would throw in some (un)welcome randomness into the proceedings that will make it easier, harder and probably more fair to score a print. So....... are we F5ing every time it's 8 minutes past the hour? It looks like scoring a print will be fairly easy this time around. I’m not entirely surprised about the slow sales. Across the Sea and season 6 season seem to have burst the Lost bubble. The slow sales suit me though, I’ve got a busy week and I can’t camp out on the computer all day! Jo Garfein (jopinionated)is hosting an awesome contest on her blog about what LOST as meant to you over the years. "It can be a photograph, poem, song, drawing, sketch, painting, sculpture, video, graphic, digital rendering, etc." Repost as wrong link was included in above post. Please... more coffee!!! So--who are the four artists you would most like to see return? 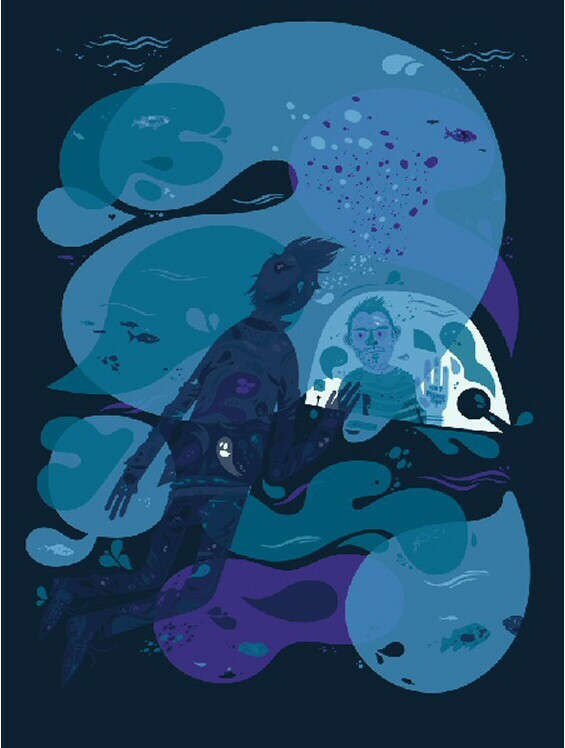 I would buy new prints from Daniel Danger, Dan McCarthy, Olly Moss and Eric Tan no matter what scenes they depicted. @Dylansdad - I would also get Dan, Olly and Eric though I'm not a big fan of Danger. I would also love another Tyler Stout print and possibly Ken Taylor. Moss, danger, tan and McCarthy. Danger, Stout, Moss and Millward. Would have Tong before Millward but as he's done three prints already, I highly doubt he is one of the four. ..I guess expecting 8:15 Sunday morning is a bit much. Been a while since I've posted but I gotta take a moment to rant. BUT, I must say that I was a tad annoyed at the final push by G88 to cash in. (Though I suppose it is a good opportunityto get a print if you missed out before) I did buy a shirt (Drive Shaft), but that was plenty for me at the moment. The real kicker was the Team Jacob design. When I first saw it I was a bit unimpressed by the repurposing of that concept. But then this weekend I suddenly remembered that just 3 months ago Mike Mitchell made some asshat comments about LOST - saying fans are basically more pathetic than heroin addicts and joking about spoiling things, etc. So it's kinda annoying that suddenly he's a "fan artist" and is cashing in on the "addicted" fans (esp with a lazy rehashed concept). I don't want to offend anyone that purchased it. Looks cool in general, but the backstory annoys me. Hello everyone! Final week (OMG...can't believe I had to type that!)!!!! Attended Lost Weekend last night. Met so many fabulous actors and they were all so super nice and friendly! Here is my Lost Weekend Album that I put up on Facebook. ^^^^^And that was comment 108!!!!! It looks like you had fantastic time maven! Since I really don't have the opportunity to travel most of these most excellent LOST events. I'm doing the next best thing & heading to see TIMES TALKS LIVE: LOST on Thursday night. Anyone else going??? Also going to need to submit a few questions. Any suggestions from the fine folks @ LOSTARG's? Mave..Thanks so much for the pics..Its good to see you and Marty having a ball...Be seeing you soon! JPL..when the Times event first came out..Phoenix had 4 theaters lined up..The last time I looked..Phoenix area is up to 6 theaters..I will be watching! D Anne..thanks for the back story!! It adds to the dimension of dislike I have for the Jacob character. Yes I bought the poster,,but it also demonstrates an artists cave in to his physical needs and wants. Mitchell couldn't stand by his own words..kinda like Jacob. Going to miss this drop too again to travel - hopefully it won't be sold out in the 20 minutes before I land (assuming same drop time). Ray, Do you want someone to get you one just in case? ChrisL - that would be awesome, thank you. Only if it's a moss, danger or tan. I really appreciate it! Only a Moss, Danger or Tan then. If it drops at the same time as yesterday I'll do my best. Hi all. Will be watching Lost Talk in LA at Regal Cinema. I think this is a delayed showing. maven and mr. maven, great shots. You are über LOST fans. See you Saturday. MEL Do you have thoughts on "Not Pennys Boat"? For such a frightening scene, the choice of whimsy is interesting. Ray, are you commented to the series? If so, think we should get you a buddy. However, we are not seeing anything selling out so far, so maybe OK.
We should probably start posting our order number/invoice time stamps so that we can tell how fast things are moving. yeah, but for this series im only interested in a couple of prints bc of wall space and can't afford all of them. So decided if any of those artists are involved again I'll go for those. Boarding - see you in a few hrs. Where can we check if this Lost event will be in a theater near me? @andalone, where did you get the timestamp? With only a few prints between us our times should be closer... maybe I'm looking at the wrong thing? And did anyone get Kimmel tickets for Sunday? 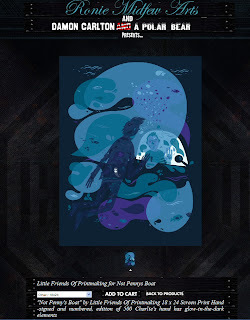 I think the new "not pennys boat" print would look great on a wall with the cartoon style ben and smokey print that came out. OK - reposting then with CORRECT timestamp! I have the Ben and Smokey (and the only Charley & Polar Bear!) and I don't like the NPB print. It's just too childlike. I love their style normally, it just doesn't seem to go with that moment for me. Easiest pass I've had since Tim Doyle's numbers. I have a couple of Doyle's prints, but that one just didn't do it for me. I just hope the Jack print sells out because the more I see it the more I like it and I know I´ll prob end up buying it. But I must save the money just in case I like any of the remaining 7 prints! concerning Kimmel..alls you can do is say how many you want..I'm still waiting to be told if I actually got any or not...Anybody having better luck than me? 12:45 now PST....start warming up the f5. Happy one week til the Finale day! actually that's not too happy. interesting... 1:08? a different time? what do you think? I'm sticking with 1.08. With no sell out on last nights I would doubt they want to confuse anyone and reduce the sales potential. I must say that I agree with Whmscl from earlier... This whole thing does all smack a little of a cash-in rather than the very clever marketing exercise that the first round was. Well I'm sure of the cash-in theory. I mean the first go round was in the works for over a year and a half...maybe 2 years. This one was clearly thrown together after the success of the first. Kind of like a movie sequel. ...though I hope they come out with some really good stuff. I wouldn't mind being in Jensen's shoes at this point. okie dokie how 'bout "I'm with Smokey"? Hello, I'm on line now in my hotel room. Just in time for 1:08 ? You made it Zort. Good Luck. was it right at 1:08 yesterday? Jensen is playing with us. It's on! Jeff Boyes for "Desmond"
now I can...do I want? or not? ack! Looks like it just released. Jeff Boyes for Desmond. Don't know if I like this one. Not one for me I think. its too realistic...and watercooler? Sure it will be cool in the flesh. Good luck folks. It's good, just not "overdraw your bank account" good. I will wait on it. Cool poster, but I think I will pass on this one. I can't resist. It's Desmond! It's not sold out, I think that was just a place holder cause it JUST got updated. It's still for sale. YAY! I just saved another $76! I agree too realistic, I do like the focus on Desmond so far though. I definitely prefer yesterday's to this one. This just doesn't grab me at all. 30X14? That'll be fun framing. I really like it but I can't see myself ever putting it up anywhere. Guess I'm 0/2 at the moment. It's Desmond... And Penny... It's...it's.... LOVE! I feel the exact same way. The fewer the good posters, the less compulsion i have to feel to buy. I hope for one or two that are good. 6 more to go! I think I would have much preferred it if Des was actually missing, so it just showed the seats and Penny. I don't really want Des' nog on my wall that big! okay,,now that I ordered it..i ought to look at it..
yeah i see that now. two Desmond themed prints in a row... I wonder how quickly this will sell out? I've gotta start showing restraint at some point, and I guess today is the day. Love Des, and cool scene, but doesn't quite make it for me.